Sailing dinghies 12ft or 14ft Smacks boats/ tenders. New builds made to order, choice of the simple and efficient unstayed lug rig or the more complex Gaff rig with bowsprit. Spars are made from Douglas Fir, wood trim and fittings all in varnished Iroko. 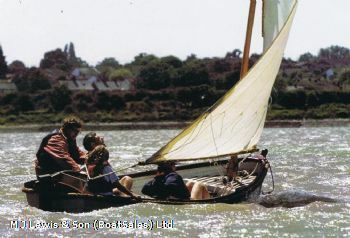 Bronze fittings by Davy’s, sails by North Sea Sails. Shipwright Brian Kennell acquired the sole rights to produce these very attractive GRP sailing dinghies/ yacht tender/Smacks boats. RCD coded. An all inclusive version with bronze fittings, hardwood sole boards, all rigging and sail. Painted and or varnished to owners own specification and supplied with a launching trolley, IRO £7,950. Brian is happy to involve his client through out the whole process, sending images and giving detail as the project proceeds. He is happy to discuss various options. Draft to 2ft 9ins with the board down. Approx sail area 82 sq ft. Weight approx 114 kg.